UPDATED: All four Hawaii counties had challenged the wording of a constitutional amendment authorizing the state to tax investment property to help fund education. A state judge on Friday rejected an emergency request to block a vote in November on whether to give the Legislature authority to tax property to help fund public education. First Circuit Court Judge Jeffrey Crabtree denied a motion from Hawaii’s four counties for a preliminary injunction, saying he didn’t think it likely they would ultimately prevail on the merits of their case or that voters would suffer irreparable harm if the measure remained on the Nov. 6 general election ballot. Led by the City and County of Honolulu, the counties argued the wording of the ballot question is deceptive and misleading, since it doesn’t state the proposed “surcharge” on investment property is actually a tax or define the exact kinds of property that would be subject to the tax. Honolulu Corporation Counsel Donna Leong speaks to the media after the judge issued an order that she didn’t want to hear. 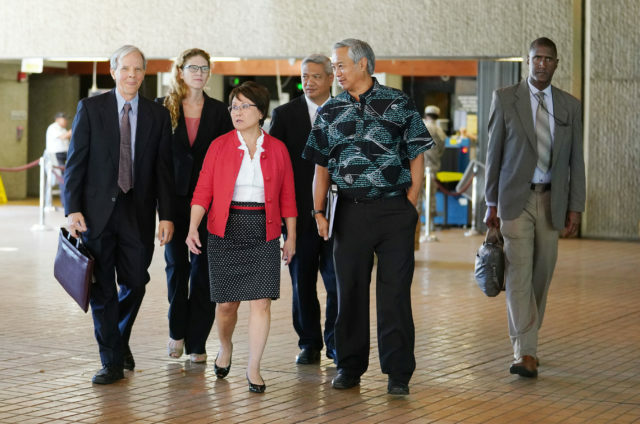 Ruling from the bench after hearing arguments from Honolulu’s chief lawyer and Hawaii’s attorney general, Crabtree said he did not find the ballot wording to be so confusing as to warrant the immediate and swift action the counties sought. “While the language is not as clear as what this court would like, I think it’s clear enough,” the judge said. “There is still a good opportunity for the court to issue a proclamation that basically informs the public that the ballot measure is invalid and their vote would not count,” she said. Leong said the counties will continue to seek the remedy of a public proclamation from the court before the November election. The parties plan to have a status conference with the judge next week to discuss next steps, she said. Backed by the teachers union to boost funding for the state’s public school system, the measure was placed on the November ballot by a legislative vote in May. Hawaii is the only state in the country that does not use property tax revenue to help fund public schools, relying largely on state general funds. But in a complaint filed late last month, the counties said the ballot measure language is vague and does not properly inform voters that it proposes giving a new taxing authority to the state Legislature. Under an amendment submitted by the 1978 constitutional convention and approved by voters, Hawaii’s counties have the exclusive authority to tax real property. The counties argued this revenue is “critical” to provide core services, including public safety, sanitation and road maintenance, while the state has “numerous major sources of tax revenues” that are not available to the counties. Leong walks with other county attorneys to a press conference after the hearing. 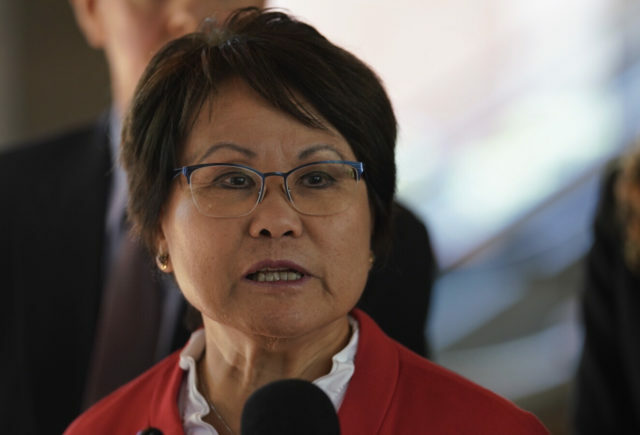 In oral arguments Friday, Leong said the language of the ballot is unclear to the “average voter” who would not understand that the surcharge is actually a tax, or that voting “yes” for a constitutional amendment would grant the Legislature a new taxing power. She also argued that since there is no definition of “investment real property” in the measure itself, there is no limitation to the kinds of properties that could be taxed. “This case is not about public education. This case is about how the ballot question is misleading,” she said. Named as defendants in the suit were Gov. David Ige; Lt. Gov. Doug Chin; Elections Commission Chairperson F.M. Scotty Anderson; and Chief Elections Officer Scott Nago. The Department of the Attorney General for Hawaii argued that the counties waited too long to file a challenge to the constitutional amendment and that it was too late to make substantive changes to the 240 different ballots that were being submitted to the printer Friday. Before arguments began Friday, Judge Crabtree signaled to the parties he was inclined to deny the motion for a preliminary injunction based on briefings submitted ahead of time. By the time the 40-minute hearing had concluded, the judge had not wavered from that initial instinct.